Add the Italian dressing and the chicken broth to the pot. Add in the rest of the ingredients. Cover the pot and turn the valve to “sealing.” Push manual and adjust the time to 17 minutes. When the pressure cooker beeps let the pressure release naturally for 5 minutes and then remove the lid. 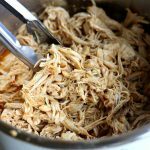 Transfer the chicken to a cutting board and shred and then add the chicken back into juices inside the Instant Pot. Stir and then serve the chicken. You may need to salt and pepper to taste. I used my 6 quart Instant Pot for this recipe an 8 quart would also work. If you want to use a 3 quart mini then you’ll need to cut the recipe in half or quarter the recipe.